One of South America's most enthralling and righteously preserved colonial destination, Cartagena will seize you in its aged clutches and refuse to let go. Cartagena de Indias is the queen of the Caribbean coast, a fairy-tale city of romance, legends and superbly preserved beauty lying within an impressive 13km of centuries-old colonial stone walls. Cartagena's old town is a Unesco World Heritage site—a maze of cobbled alleys. 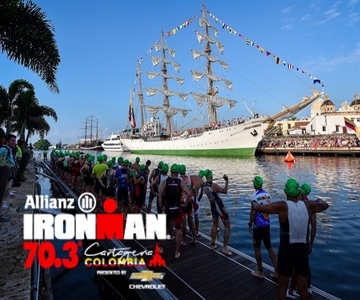 IRONMAN 70.3 Cartagena offers 30 qualifying slots to the 2019 IRONMAN 70.3 World Championship. Professionals compete for $25,000 prize purse plus 70.3 WC slot.